I’ve scored a cornucopia’s worth of free produce in the past couple weeks thanks to generous neighbors and coworkers. Nothing says summer like fresh-from-the-garden fruits and vegetables! First up was the watermelon our photo editor brought back from an assignment. There were a couple melons in the newsroom, just screaming to be eaten, so I carted one of those bad boys home, made a mess of my kitchen while hacking it up, and enjoyed those sweet, pink, juicy chunks with breakfast for about a week. Carmen, our neighbor across the street, has quite the flourishing tomato plant in her yard. I sliced up a recent delivery and roasted them with breadcrumbs (Tried and liked a Meatless Mondays recipe from the ladies at Big Girls, Small Kitchen). Yellow squash brought home from the office and sliced into thin chunks tasted zingy after a quick toss in the frying pan with a teaspoon of sambal oelek and a tablespoon each of soy sauce and rice vinegar. And for dessert, we have peaches from neighbor Patrick. I opted to slice up five or six of these fuzzy delights and baked them into a crumble, using a Jamie Oliver recipe for inspiration. 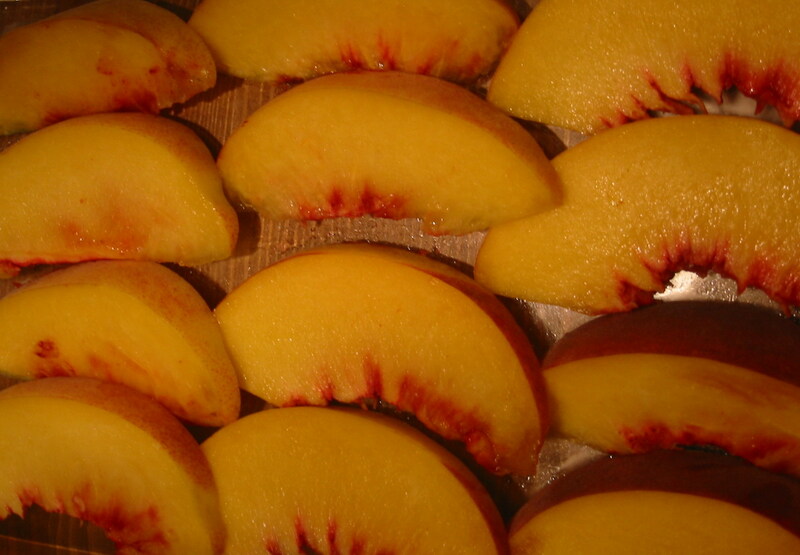 Layer peach slices in a glass baking dish and sprinkle with two tablespoons brown sugar. Combine all other ingredients in a bowl, using hands to make a crumbly mix. Spread mixture over prepared fruit. Bake at 400 degrees for roughly 30 minutes, until top is golden.